A perfect savory dish for mushroom lovers! I needed something to bring for my work’s Pie Day Fundraiser. Yes, sugar sells but an easy take home dinner sells even better, or so I had heard. Mushrooms are one of my favorite foods and I knew I wanted to showcase them! Confident in my idea, I completed the shopping a few days prior. However, the day before pie day, I was talking with one of my coworkers from Indiana. She was not going to be in the office for Pie Day and was bumped to be missing the event where we bid on pies. I told her I was making a savory mushroom pie and in some ways, I expected her to say cool, yum!, interesting… Instead, she told me that I better really, really like mushrooms because I would be taking that pie home! Mushroom haters, this pie is not for you! But for those of you who love mushrooms as much as I do, this will not disappoint! And this pie sold at the auction with multiple bidders who bid on their own (and like mushrooms)! 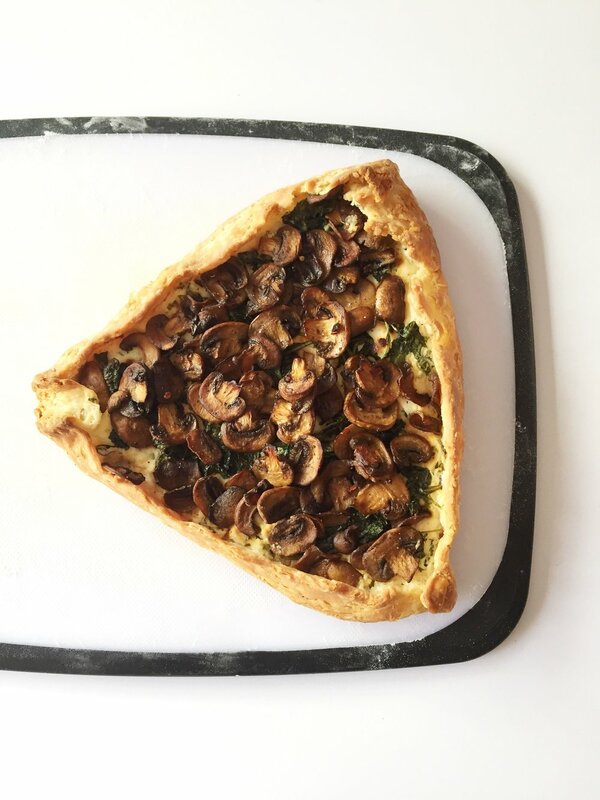 Beyond the ‘shrooms, this pie has cheese and kale! A key component of the savory pie is the cheese layer which helps prevent liquid from the filling leaking into the crust causing the infamous “soggy bottom” that Mary Berry and every British baker dreads. Goat cheese, cream cheese, and ricotta are all great soft cheeses that make a salty and protective layer. 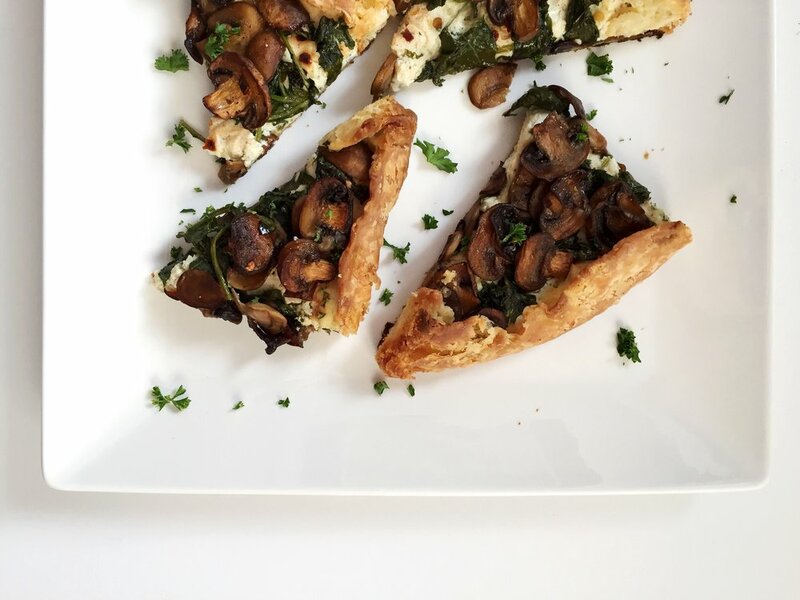 I used baby kale, but you could also sub spinach for a slightly bitter flavor to contrast with the buttery pastry, meaty mushrooms, and salty cheese. This pie also doubles as an excellent eggless brunch dish! If you prep the dough before, it’s easy enough to roll out and fill for a noon-time brunch! Mushrooms are magical, celebrate them with this pie! Cut butter into ¼ inch cubes and put in the freezer. In a food processor, pulse sugar, salt, and flour until combine. Add the cold butter and pulse until combine. Sprinkle the ice water into the food processor while pulsing. Pulse for 5-10 seconds or until the pastry looks and feels like sand. Place onto a floured surface and make a ball. Refrigerate for at least 30 minutes and up to 24 hours. Mix ricotta, lemon zest, parsley, ¼ teaspoon salt, and pepper to taste. Set aside. In a skillet over medium-high heat, add 2 Tbspn. Olive Oil. Cook mushrooms for about 6-8 minutes or until the mushrooms are lightly golden in color. Deglaze the pan by adding 2 Tbspn of white wine (optional) and cook off for 1 minute. Season with salt and pepper. Remove mushrooms, set aside, and add 1 Tbspn. Olive oil. Add baby kale and cook until wilted, about 1 minute. Season with a pinch of salt. Roll out the pastry until it is about ¼-⅓ inch thick. Spread ricotta mixture onto the pastry leaving 1 inch around the edges. Place wilted kale over the ricotta and then the mushrooms. Season with chili flakes. Fold over the edge of the pastry, pressing it to the galette filling. Cook for 45-50 minutes at 400F or until the edges are lightly browned. Top with balsamic glaze, optional. Let it sit for 5-10 minutes. Cut into slices and serve!